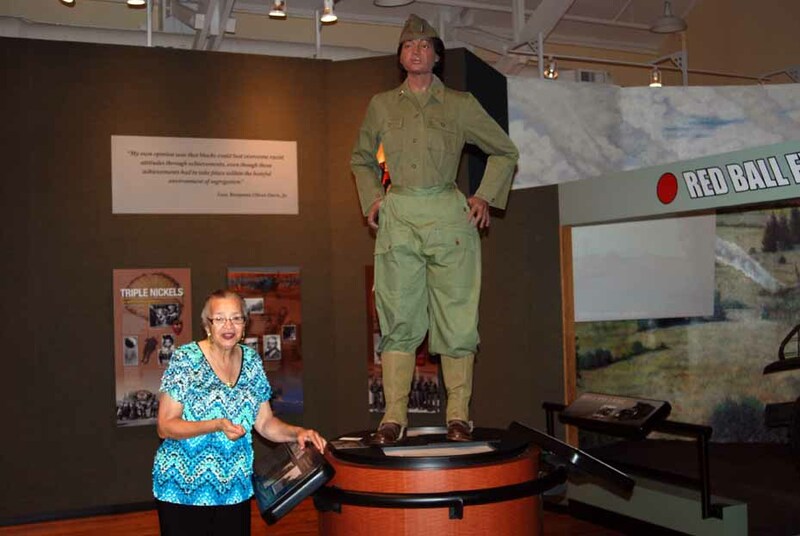 Mrs. Iola Williams stands near mannequin in African American Military History Musuem representing Ruth Bailey Earl, who served as Army nurse during World War II. HATTIESBURG, Mississippi — For Iola Williams, you can not only come home again, but you can click your heels after decades of living away, return to the memories of home, and then dedicate yourself to making home a better place than when you left it. Whatever you left with, you return accomplished in raising a family, experience as a community activist, committed and dedicated to service. In all those years of being away from Hattiesburg, The Hub City, here in South Mississippi not that far removed from the piney woods, Williams was stationed all over the country with a husband in the U.S. Air Force. They raised seven children. She served as an elected official — first the school board and then city council — in San Jose, California, where the family settled and Mrs. Iola became vice mayor. The Senior Citizens Program in San Jose was established by Williams and colleagues on city council honored her by calling it the Iola Williams Seniors Program. In the Silicon Valley, she built a track record for seeing proposed projects through to completion. Delegates elected her state president of the League of California Cities. Williams also held a carefully cultivated leadership position in the state Democratic Party in California. Williams’ handiwork here was to help found the African American Military History Museum. It was a revival, really, of the USO Club in Mobile, the city’s black section, center for business and entertainment. Here at Mobile Street and 6th Street, this community placed the welcome mat out for African American soldiers in the 1940s. In those days, when Iola Williams was growing up in Hattiesburg, African American soldiers from nearby Camp Shelby, awaiting assignment to the battle fields of World War II, took umbrage from the social customs of the times, came here and had a good time at the USO Club. Food was served. There is a stage for live music, a dance floor, an auditorium, and enough other space for general socializing. Mrs. Iola, that’s the way she is addressed by Heather Sanchez, a museum researcher at the USO Club. Sanchez, a graduate student at the University of Southern Mississippi, is from nearby Laurel. Away from here, Mrs. Iola never did forget the neighborhoods of Mobile and Bouie, especially recalling the movie theatre, restaurants, family, going to school and attending church here. Back home from California, Mrs. Iola easily transitioned into a role as linchpin, melding a voice that distilled work with the buoyancy of history. She made connections just as readily as Hattiesburg is the Hub City, formerly a junction place for railroads. In 1992, then Mayor Ed Morgan wanted her to come and work for the city. Morgan appointed her director of Recreation and Community Relations. As stated between them in a conversation, Morgan couldn’t pay Mrs. Iola a California salary, but he did agree to move forward in redeveloping the out-of-use USO Club. The city had acquired the facility in 1993 that had been ignored and in a state of disrepair. Locals say that Melvin Williams, president of the Mobile-Bouie Neighborhood Association, applauded the agreement and took a wait-and-see approach to Morgan’s agreement to do something with the old USO Club. The USO Club held precious memories for Melvin Williams and Mrs. Iola, all residents of the Mobile/Bouie sections of the city old enough to remember back in the day. Thousands of black soldiers came here on weekends to dance the night away. Swing back then — soon to make way for bebop led by Charlie Parker and Dizzy Gillespie — dominated bandstands with the music of Chick Webb, Cab Calloway — remember “Minnie the Moocher,” “The Jumpin’ Jive” and “Hi De Ho Man”? Duke Ellington and Count Basie, among others, were also in popular regard back then. After Mrs. Iola joined the mayor’s office, she sent out a call and challenge to area veterans to lend, donate, collect and find artifacts that would ultimately be put on display in what would become the African American Military History Museum. Improvements were backed by a 2-percent sales tax on food and beverage collected from customer tabs at local restaurants. With the revenue, the impressive Lake Terrace Convention Center was built and renovations were made to Saenger Theater. Then the plan to transform the USO Club into African American Military History Museum went into action. Rick Taylor, executive director of the Hattiesburg Convention and Tourism, noted in an annual report that the project cost $1.1 million for building restoration and another $400,000 for exhibits. The museum joins the vanguard of heritage tourism, which is trending favorably all over the United States. Brown directional signs with white lettering on Interstate 59 and pictorial signs here on city streets lead visitors to the area for what is very much a rich historical experience. If you are not old enough to remember the USO Club — rather, remember it as the former library and community center — the modal approach of getting to a sense of belonging is to learn the people and events in the exhibits of the African American Military History Museum. The USO Club here is the only one that remains in use in the United States that served black soldiers. Mrs. Iola is serving her third two-year term as a commissioner on the Hattiesburg Convention Commission. Mayor Johnny DuPree reappointed her to another two-year term beginning August 18, 2012 and ending August 17, 2014. Meeting Mrs. Iola, her beautiful face, connects to those wonderful times. In the present, it is very much obvious that she is a doer and able to hub, as it were, leadership in Hattiesburg. Outside, music of the era blares from loud speakers, beckoning visitors. There is a memorial garden. An obelisk has the names of Hattiesburg soldiers lost in the two world wars, Korea and Vietnam. Inside, Mrs. Iola’s favorite exhibit is the one dedicated to Army nurse Ruth Bailey Earl, who served during World War II. Earl’s family was friends of Mrs. Iola’s family here in Hattiesburg. Ruth Bailey Earl died in 2004. Among exhibits that honor African American contributions to the military is that of Ensign Jesse L. Brown, the first black naval aviator. He died in the line of duty at the age of 24. Brown, a graduate of Ohio State University, was born in Hattiesburg. One photo exhibit has a compelling reminder: “There has been no war fought by or within the United States in which African Americans did not participate.” Indeed, exhibits in here extend from Crispus Attucks in the American Revolutionary War, the fate of Henry Flipper, to President Barack Obama as commander-in-chief. There is also a Hattiesburg Hall of Honor. This afternoon, Latoya Hathorn Norman, museum relation specialist, is leading a group of elementary school-age children on a tour of the African American Military History Museum. Others on staff here, like Mrs. Iola, had many successes while living away from their place of birth, Hattiesburg, then decided to return home with those successes. Mrs. Iola is the wife of Master Sergeant George Williams Sr., a career man. They were stationed at various bases in South Carolina, Texas, Virginia and Illinois, three bases in California, and spent three years in Europe during his 20-year Air Force career. Her college experience is the result of multiple matriculations and a HUD Fellowship to the Kennedy School of Government at Harvard University, completing coursework in 1980. In San Jose, there is the Iola Williams Scholarship. It is given to a full-time African American student at San Jose Community College or a student attending an in-state, four-year school. Mrs. Iola recalled making frequent trips from San Jose to Hattiesburg to keep check on her mother. She and George bought a manufactured home so that they wouldn’t have to light on anyone and, thinking ahead, already have a place should expediency demand a decision to come back home in the twinkling of an eye. That did happen. Retiring from the City of San Jose in 1991, movers were hired and sons came to help load up the moving truck with household effects. Just like that, no notice to friends or colleagues, Mrs. Iola was back living in Hattiesburg. Later, friends and colleagues were sent an email from her “old and retired” email account, messaging them on the retirement and relocation. “Old and retired” remains part of her email address. George and Mrs. Iola are the parents of four girls and three boys. Four of their children still reside in San Jose. Jenifer, who holds an MBA from the University of California at Berkeley, retired from management in the high tech industry. She now owns a business designing and producing custom bridal gowns, as well as making custom clothing. Audrey is employed in a non-profit organization as an accountant. Vincent is a San Jose police officer and George Jr. is disabled. A daughter and son ended up in Texas via Fort Hood. Kevin was a sergeant and Beverly a sergeant’s wife. Kevin left the military honorably and is employed in automotive sales. Beverly, a graduate of Grambling University, is a social worker for Texas Children Protective Services. The youngest girl, Ila, is a West Point Military Academy graduate. Nowadays she lives in Flanders, New Jersey, where she is employed in human resources for an energy company. George and Mrs. Iola have 16 grandchildren and three great-grandchildren. Solomon, a great-grandson, has been raised by the couple since he was 18 months old. He is now 13. Besides serving on the Hattiesburg Convention Commission, Mrs. Iola also works in ministry, gathering senior citizens for lunch at four churches on a revolving basis. The ministry was started at True Light Baptist Church by Mr. Williams, who, upon driving seniors to doctor’s appointments, noticed appointments served as cover for a social outing for the lonely. Work in heritage tourism continues in Hattiesburg. The next restoration and redevelopment project, funded by that 2-percent food and beverage tax, is turning historic Eureka School, where Mrs. Iola attended during the time of Colored Schools, into a civil rights museum. The school is historic because it was the first brick school building built for Colored students in Mississippi. The Eureka School Museum will document the Civil Rights Movement in Hattiesburg. The museum is seeking artifacts from the period. Please contact Kelly Davila by email at kdavila@hattiesburg.org or call (601) 450-1942. 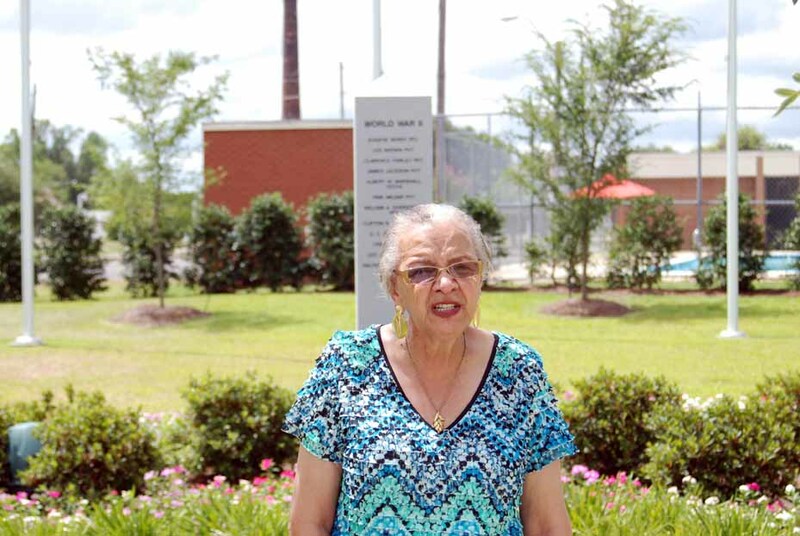 Mrs. Iola Williams stands in memorial garden of African American Military History Museum honoring Hattiesburg soldiers lost in the two world wars, Korea and Vietnam.